Van Meter in a mugshot from the Indiana State Penitentiary. 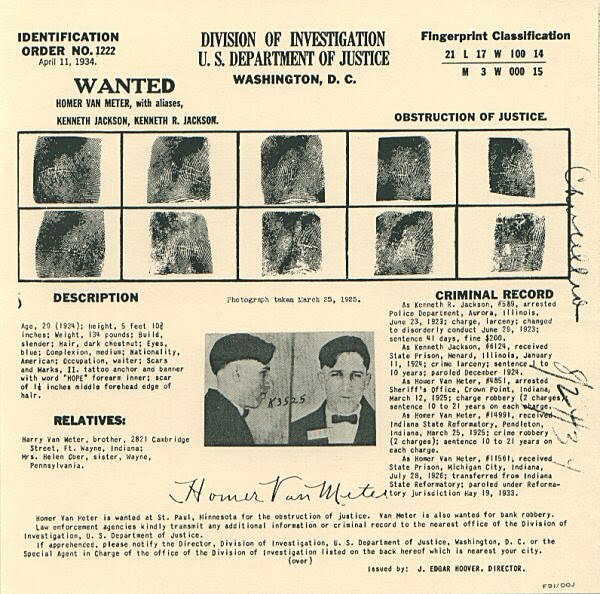 Homer Virgil Van Meter was one of dozens of bank robbers who cris-crossed the Midwest during the Depression Era. No more resourceful or violent than many others, he likely would have faded into obscurity had he not become involved with John Dillinger. Born in Fort Wayne, Ind., Dec. 3, 1905, he was the son of Cary B. Van Meter (1871–1918), a hard drinking railroad conductor, and Julia Miller (1872–1924). Van Meter left school in the sixth grade, where he was listed as an average student, and ran away from home when he was 12, eventually making his way to Chicago. He managed to find work as a bellhop and later as a waiter. Van Meter's boyhood home in Fort Wayne, Ind. His first known arrest came a few years later when he was charged with drunk and disorderly conduct. He was arrested again on June 23, 1924, in Aurora, Ill., on a larceny charge and served 41 days. On Jan. 11, 1924, he was arrested for car theft and eventually sentenced to the Southern Illinois Penitentiary (now known as the Menard Correctional Center) in Chester, Ill. At the time of his admission, records show he had a tattoo reading “HOPE” on his right forearm and had a case of syphillis. Van Meter was paroled in December 1924, but was arrested just three months later when he and a former cell mate robbed passengers on a train in Crown Point, Ind. This time he was sentenced to 10 to 21 years in the Pendleton Reformatory. It was in Pendleton where Van Meter met John Dillinger and Harry Pierpont. Van Meter and Dillinger became friends, but he and Pierpont openly despised each other. Records show Pierpont, while a trouble maker and rule breaker, was standoffish and generally quiet, the exact opposite of Van Meter, who was loud and a practical joker. In fact, it was Van Meter’s repeated antics and demeanor that earned him a July 28, 1925, transfer to the more restrictive Indiana State Prison in Michigan City. Ironically, Pierpont was also transferred there at about the same time because of his attitude problems. In January 1926, Van Meter was taken to Chicago to testify in defense of a man wrongly accused of being his accomplice in the 1924 Crown Point train robbery, and he used that opportunity to escape. However, he was apprehended within the hour when found near the station begging for change from passersby. Just a week later he attempted another escape, this time with cellmate Charles Stewart. They managed to saw through the bars of their cell and beat a corrections officer unconscious but were caught while still on the prison grounds. As a penalty, he spent two months in solitary confinement where he said he routinely beaten by prison guards. 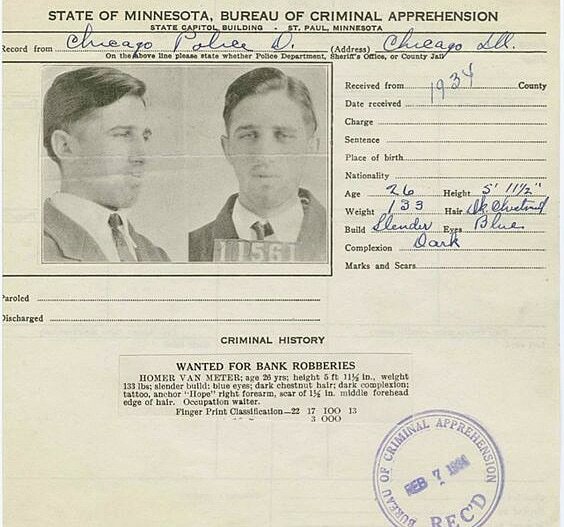 Once returned to general population, Van Meter’s prison record is relatively clean, and he was granted parole on May 19, 1933, just a week after Dillinger earned his parole. Van Meter quickly returned to crime and on Aug. 18 robbed a bank in Grand Haven, Mich., with “Baby Face” Nelson and Tommy Carroll. They got away with $30,000. On Oct. 23, joined by John Paul Chase and Charles “Chuck” Fisher, the five robbed a bank in Brainerd, Minn., of $32,000. Van Meter was quickly becoming the focus of law enforcement, and when Illinois published its list of "public enemies" at the end of 1933, Van Meter ranked 18th. Within months, Van Meter, Carroll and Nelson formed a gang with Dillinger, John “Red” Hamilton and Eddie Green and together they robbed the Security National Bank & Trust Company in Sioux Falls, S.D., on March 6, 1934. The gang escaped with $49,500. It was just three days after Dillinger had broken out of the Crown Point, Ind., jail allegedly using a wooden gun. Just a week later, on March 13, they robbed the First National Bank in Mason City, Iowa, of $52,000. They had made some big scores and the violence was kept low ... but it was all about to come crashing down on them.